Angela Brooks became the Plant City Family YMCA’s full-time wellness director earlier this month. Ten years ago, Angela Brooks wanted to try something new in her life and became an exercise instructor at the North Brandon YMCA. She enjoyed it so much, she traveled down a career path that took her from Hillsborough County to the other side of the Atlantic Ocean and, as of 2016, back again. 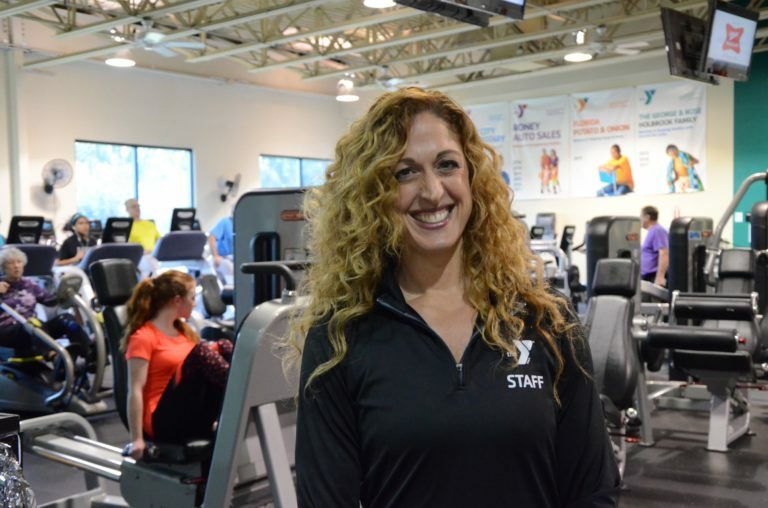 Brooks wants Plant City residents to get fit at the Plant City Family YMCA and, at the beginning of the new year, she was handed the reins to do so. The former wellness coordinator is now the Plant City Y’s wellness director and will be one of the staff members assigned to stay in Plant City full time, as opposed to splitting time between there and the North Brandon Y.
Brooks said the YMCA’s vibe is what drew her out of a career in sales in 2005. The Long Island, New York native began working in the North Brandon Y’s membership department that year after taking a break from a career in sales to raise two children. She tried her hand as an instructor three years later after a coworker encouraged her to give it a shot, and Brooks never looked back. She got a change of scenery in 2013 when she and her family moved to England. Working for several American contractors, Brooks taught fitness classes on and off-base at RAF Mildenhall and RAF Lakenheath, leading classes to help Air Force personnel meet PT test requirements and help their families get fit. When she moved back to the United States in 2016, Brooks knew she wanted to get back to a YMCA. She joined the Plant City staff as a coordinator and fell in love with the facility, its members and the community. She teaches BodyPump classes on Wednesdays and also enjoys leading H.I.I.T. and Pilates classes when she can. Now that she’s received a promotion, Brooks has big plans for Plant City. The first thing members will notice is the new look the gym floor equipment has gotten. Existing strength equipment has been repainted and reupholstered, new barbells have been added and a wave of new cardio machines was brought in. The Y now has a total of 17 spin bikes, meaning the spin classes are set to move into a larger room. The equipment installations are expected to be finished in February or March. The Y has opened up its members-only Saturday morning boot camp classes to the public for the month of January, and Brooks said she hopes to make the family boot camp series that ran over the holidays into a permanent fixture on the schedule. She also wants to bring small-group personal training classes to the Y, and any classes that will benefit families and children. Though the plans have not been finalized, Brooks said a weightlifting competition is in the works. “Plant City’s Strongest” is expected come to the Y in the spring. Brooks said the Y is working with Moffitt Cancer Center to bring a series of “Lunch and Learn” events and other health workshops to Plant City. Topics covered would include maintaining healthy lifestyles and cancer awareness. The goal is for workshops to be available in both English and Spanish to reach the widest possible audience. Brooks hopes to help the Y become Plant City’s first choice in fitness and believes it’s the perfect spot for anyone to get started.